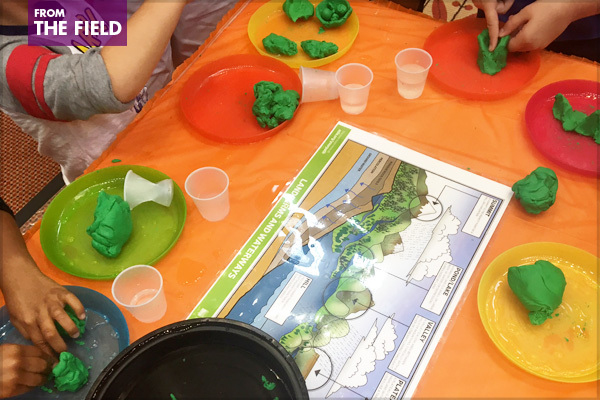 As attendees interacted with the activity, they were given the opportunity to build various landforms from clay and learn about the different landscapes that exist in nature and the built environment (e.g., lakes, summits, valleys, plateaus, etc.). The clay was a huge hit as most kids thought it was Play-Doh right from the start. 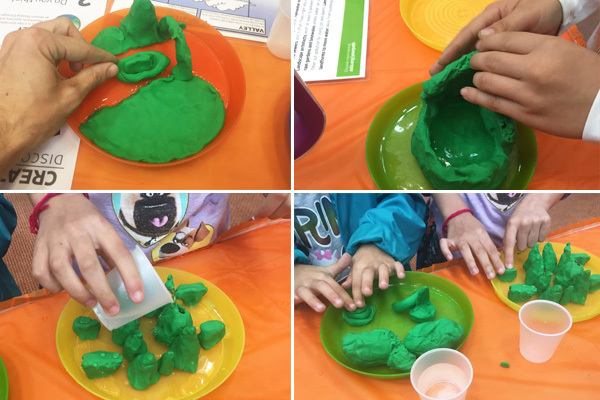 Much to their surprise, they quickly discovered that the sculpting clay was slightly stiffer than the soft medium typically used by kids (Play-Doh could be used, but in order to take on water throughout the day, sculpting clay was a smarter material). ASLA staff and local volunteers worked with kids to select landforms to build and discuss the various locations where they could be found. It was amazing to see the imagination and thought process behind many of the landforms. From a forest of summits to an archway over a river, it was a lot of fun to see the creations come to life. Many of the younger kids raced to build their landforms so they could get to step three as quickly as possible—“pour water on your landform and find out how water moves on land.” As the day progressed, the activity got a bit messy, but the kids really loved the ability to build with clay and use water to interact with their final product. While the kids worked on the landforms, parents watched and also assisted in teaching their kids about the built environment. 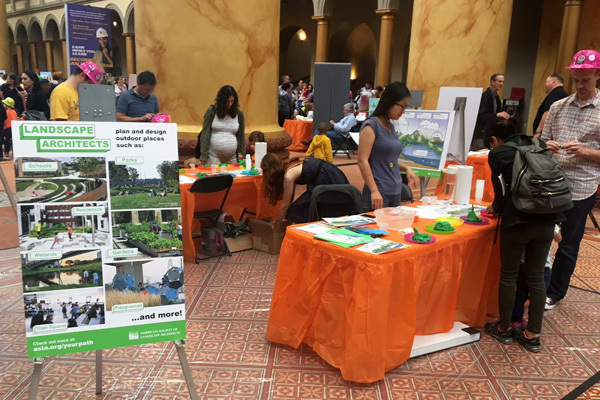 It was fun to watch the parents interact with the promotional material detailing landscape architecture. As usual, many parents were unfamiliar with the profession of landscape architecture. After a quick synopsis of the profession and a quick glance through YOUR LAND, many of them became intrigued by the breadth of work designed by landscape architects. I like to think we may have inspired a few future landscape architects! This exercise is just one way to get kids involved in understanding the built environment and one step closer to learning about landscape architecture. There was not a lot of opportunities to speak directly about landscape architecture to many of the kids because they were just too young to fully understand the concepts of the profession. But, this exercise truly opened up their eyes to the built environment and their understanding of natural and manmade landforms. It was also a valuable lesson on how landforms can affect how water moves on land (especially with Hurricane Harvey and Hurricane Irma hitting the U.S. just weeks prior). If you have opportunities lined up to talk with K-12 students in 2018, I encourage you to be creative in your approach. Presentations are great, but interactive, hands-on activities really capture the student’s mind and attention. As ASLA’s career discovery and diversity work plan continues into 2018, new resources will become available as revisions to the ASLA Career Discovery webpage are made. 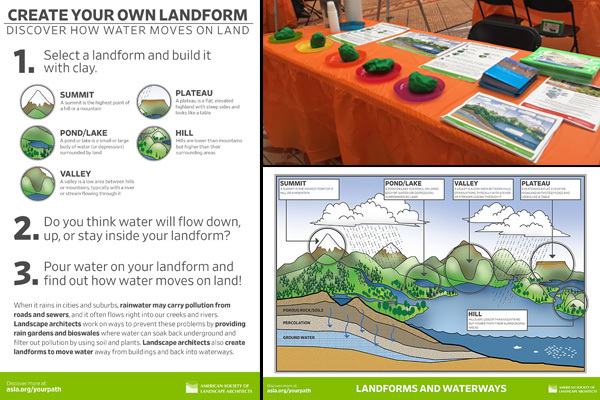 In the meantime, if you are interested in using this hands-on activity, Create a Landform: Discover How Water Moves on Land, please email discover@asla.org to request a copy of the poster and handout. Or, if you are interested in making your own activity, check out this fun educational video Landforms, Hey!, and have fun selecting your landforms. Next Article A Call for All Children’s Outdoor Environments PPN Authors!